Over the years, we've expanded Gmail's communication abilities by allowing you to make voice and video calls to other computers and more recently call phones. Until now, though, you were limited to making one call at a time. Today we're excited to relax that restriction and allow you to make or receive multiple calls in Gmail. If you’re in a call and make a second one, your first call will be put on hold while you talk on your new call. You can switch between calls by pressing the “Resume” button on the call you want to talk on, which will automatically put the previous call on hold. Receiving incoming calls while you're in another call is just as easy: you'll receive a notification of the incoming call and can choose to accept it or not. If you take the new call, the previous call will be put on hold. Whether you make a second call or not, you can now put any call on hold — useful in case you need to talk to someone in the room or grab something off the stove. Just press the “Hold” button and then “Resume” to start talking again. 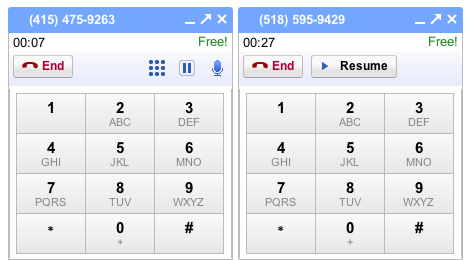 This feature works across all call types (voice, video, and phone); the only restriction is that a maximum of two outgoing calls to physical phones can be placed at once.